You guessed it right! Quinoa is one of my favorite grains! It is so versatile and can be used in all types of foods! Apricots are those beautifully orange colored fruits full of beta-carotene, fiber, rich in vitamin A, vitamin C and potassium. They are one of the first signs of summer.And, are originally from China but arrived in Europe via Armenia, which is why the scientific name is Prunus armenaica. 6 small apricots (around 150g) equal one portion of fruits. In order to include apricots in one of my recipes, i decided to try this combination of cooked quinoa with diced apricots, oregano, dried thyme and a sweet balsamic dressing! The end product turned out to be another succulent quinoa based platter! It was shown on OTV yesterday during my live segment.. Here’s the recipe for you! I strongly recommend that you try it especially at night if you feel like having a light and consistent dinner! 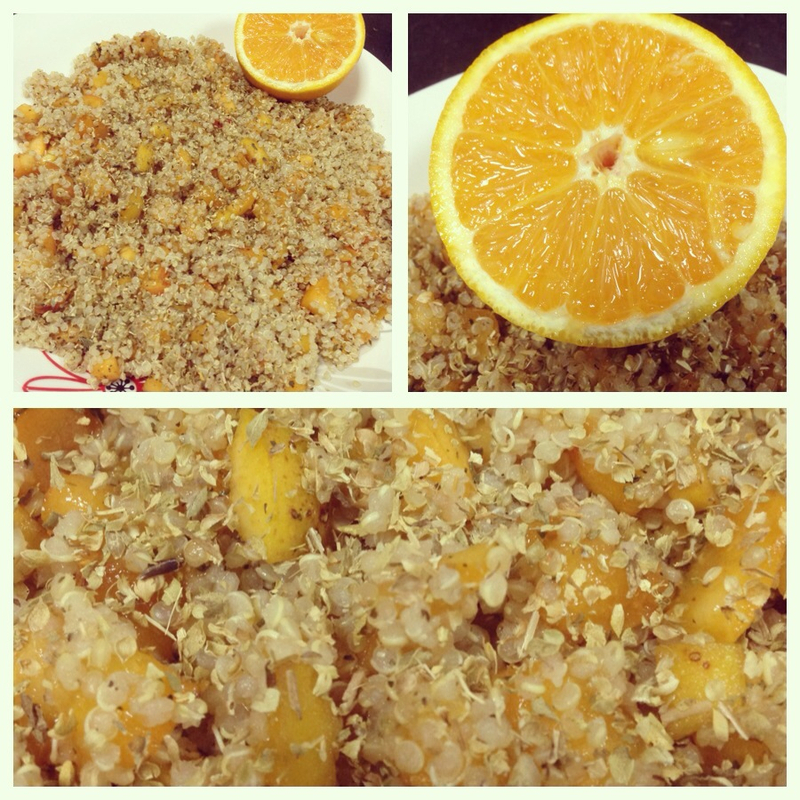 Mix the cooked quinoa with the apricots. Sprinkle oregano and thyme. Add the dressing and enjoy! *You can add rocket leaves, green onions or “ciboulette” and dill! This salad contains around 350 calories! ← ~*Cherry Quinoa muffins ..